This control is compatible with the 1996 (ED) and newer Modular Wiring System. This control supports the SystemCheck™ engine monitoring system and allows single-lever control of dual Evinrude® or Johnson® outboard motors. Call out NUMBERS (1), (2), etc. in text and illustrations refer ONLY to specific items in Contents of Kit illustration and list. Call out LETTERS (A), (B), etc. are used over and over - different items on other pages. To the Installer and the Owner - INSTALLER: Give these instructions to owner. OWNER: Read the section Remote Control Operation and also Remote Control Adjustments, located at end of this document, before you operate your boat. Keep these instructions with your Operator's Manual. If a non-BRP instrument cable is used, it must have connections for the "start-in-gear-prevention" switch in this control. It must also have a key switch, (and for Evinrude/Johnson outboard motors, a primer switch, and a warning horn). 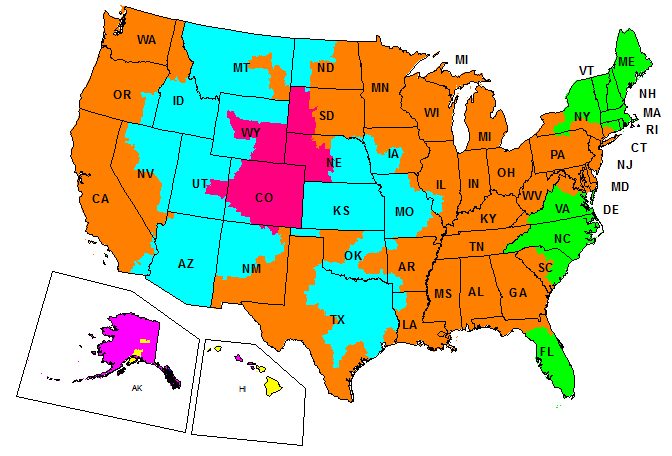 It must have equivalent wire type and size, and must also meet U.S. Coast Guard safety regulations and A.B.Y.C. standards (or standards that apply in your country). Shift Disengage - To open throttle without shifting into gear (for easier starting if motor does not have QuikStart™ electronic starting). Push and hold the shift disengage button (A) with control handle in NEUTRAL (B), and move handle to either shift detent position, (C) or (D). Release button and move handle more to open throttle for starting and warm-up. The shift will re-engage when the handle is returned to NEUTRAL. NOTE: Pull lever part way back as soon as motor starts. Do not run a cold motor any faster than necessary to keep motor from stalling. Do not exceed 2500 RPM in NEUTRAL. For motors with QuikStart, wait until motor speed drops to a normal idle RPM before shifting into gear. A minimum of 20 inc. (508 mm) (H) of fore-and-aft space is needed to operate this control. This will provide 2 3/16 in. (55 mm) (I) hand clearance in front of the handle at wide-open-throttle (W.O.T.) in FORWARD, and 1 in. (25 mm) (J) behind the handle at W.O.T. in REVERSE. Remove template from instructions and place at proposed control location. Check handle and hand clearance dimensions in FORWARD and REVERSE W.O.T. positions. Move template until a satisfactory control position is found, and tape template in place with arrow pointing to front of boat. There must be at lease 19 in. 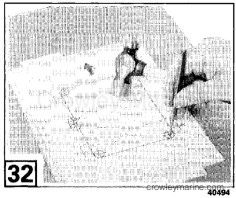 (482 mm) (P) of clear space below the mounting surface for the control cables. From center of handle at (A), measure along intended cable route to each motor centerline at transom height (B) and (C), as illustrated by dotted lines. - For Evinrude/Johnson outboards, add 3 ft. 4 in. (1,02 m) to these measurements. These dimensions are the required cable lengths. - For OMC Cobra® engines, see the product service manual for control cable lengths. Snap-In/SAE cables have a Snap-In type input end and a standard SAE output end. They are available in one foot increments from eight foot to twenty foot length, and in two foot increments to thirty foot length. Lift cover (2) off remove control (1) if installed. Don't lose rubber boots (3) from shift disengage buttons. Note which is front and rear sides of control as installed in boat (trim switches are in port handle). 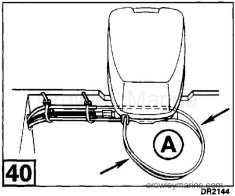 When you pull the throttle cable on Johnson and Evinrude outboard motors and on OMC Cobra engines, the throttle LOSES, and when you pull on the shift cable the motor goes into FORWARD GEAR. Therefore, put control handle in FORWARD detent position. Mark the throttle and shift levers (A), (B), (C), and (D) that are now UP. The cables are attached to these levers. Does it pull the throttle to W.O.T. ( Wide Open Throttle), or to close the throttle? 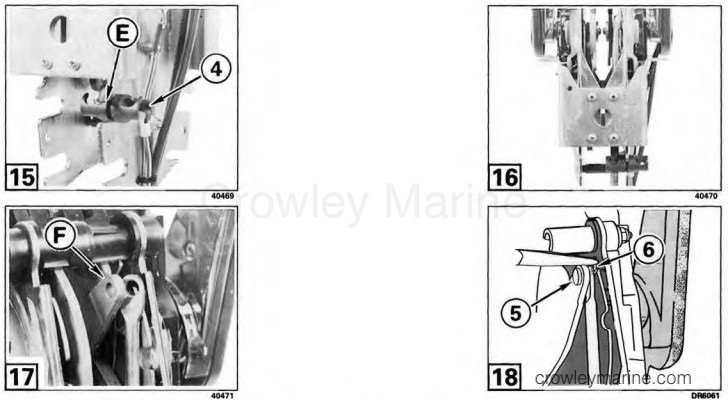 To install throttle cable, place trunnion anchor (4) into upper slot (E). Pull cable up to handle side of throttle lever (S), aligning hole in cable with hole in lever. To install shift cable, place trunnion anchor (4) into upper slot (A) in rear of port control. Install cable pin (5) through cable and inner hole in shift lever, from handle side. Install cotter pin (6) and secure by spreading ends. 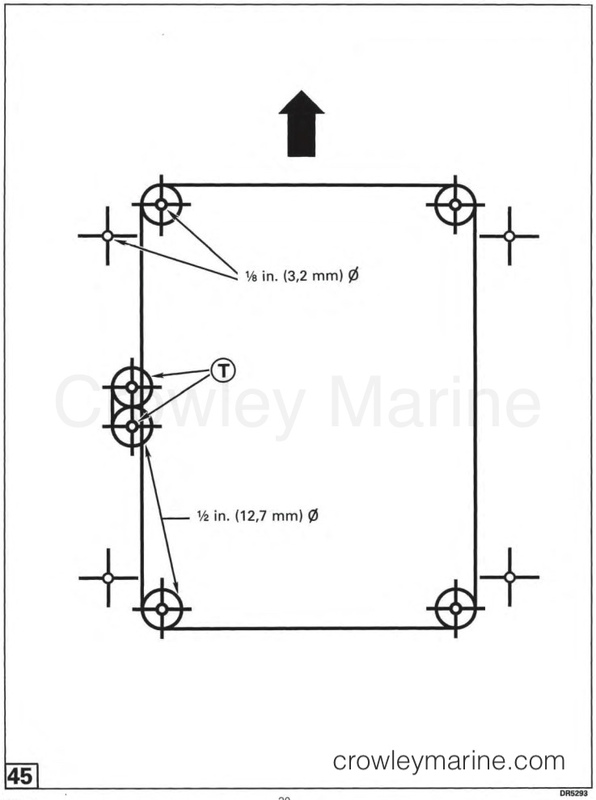 To install shift cable, place trunnion anchor (4) into upper slot (F) at rear of starboard control. Install shift cable trunnion into starboard side of anchor. Pull cable end up to handle side of shift lever (G), and align hole in cable with inner hole (H) in lever. 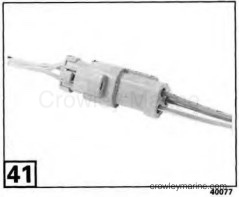 To install throttle cable, place cable trunnion into other end (A) of shift cable trunnion anchor. Pull cable up to handle side of throttle lever (B), aligning hole in cable with hole in lever. Install anchor retainer (7) onto trunnion anchor and both cable trunnions. 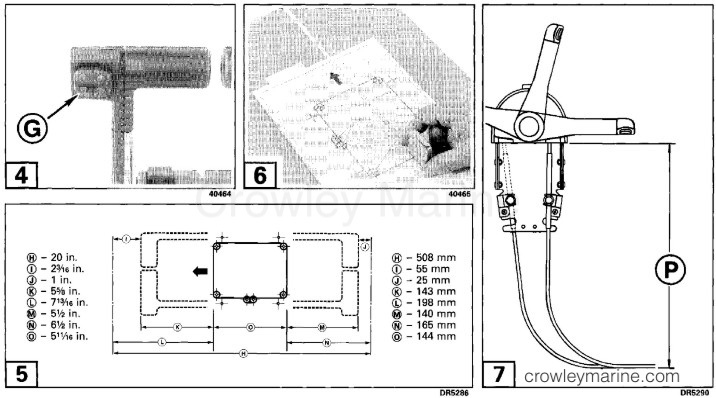 Install screw (8) and locknut (9). Tighten screw securely. Disconnect battery cables from battery before drilling or sawing near electrical wires to prevent possible injury form shorting a hot wire to ground. Evinrude/Johnson outboards, connect one yellow/red neutral start switch wire (D) from remote control to key switch "S" terminal (E). Connect second yellow/red neutral start switch wire (F) from remote control to key switch cable bullet connector (G). Locate the six-socket plug (H) on instrument cable with the same color wires as the key switch cable. Check mating surfaces of six-pin and three-pin connectors for dirt or other contaminates. Remove all dirt, old lubricant, etc. Immediately before joining, apply a light coat of Electrical Grease to seal (I), and also on seal (J) if control has trim and tilt. For OMC Cobra engines, cut terminals off both yellow/red stripe wires and re-terminate as required for your key switch and wiring harness. Evinrude/Johnson outboards; Align six-socket plugs (K) on instrument cables with key switch receptacles (L). Push connectors together until latched. Align three-socket plugs (M) on instrument cables with control receptacles (N). Push connectors together until latched. Place rubber boots (3) over shift disengage buttons and position cover (2) on control. Secure cover and control with screws (10) provided. Check that remote control operates freely and equal friction is felt in FORWARD and REVERSE throttle range of control handle. Any binding could cause remove control to jam when cables are attached to motor. 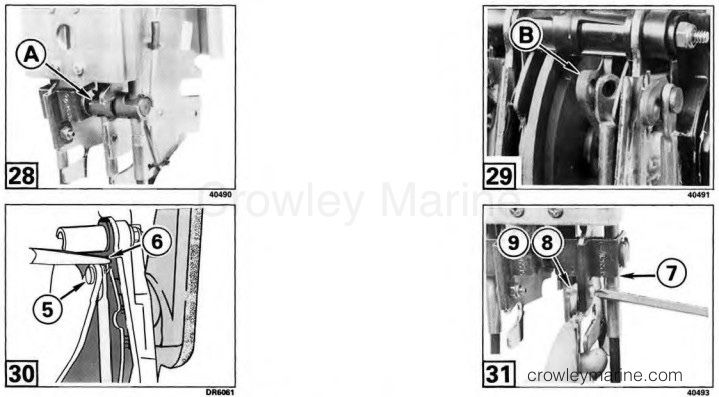 Install adjustment screw cover (11). Install decal (12) in center recess (O) of cover if desired. Route control cables in a straight line, without sags, and secure to boat every 24 in. (61 cm). Place first fastener 24 in. (61 cm) behind remote control. If you use cable clamps, do not squeeze cable out-of-round. You must provide a 12 in. (30 cm) minimum diameter loop (A) in cables between last boat fastener and outboard motor anchoring point. Before connecting cables to motor, check that control operates freely, that shift re-engage in NEUTRAL after disengaging for warm-up, and equal friction is felt in FORWARD and REVERSE throttle range of control handle. Any binding could cause control to jam when cables are attached to motor. 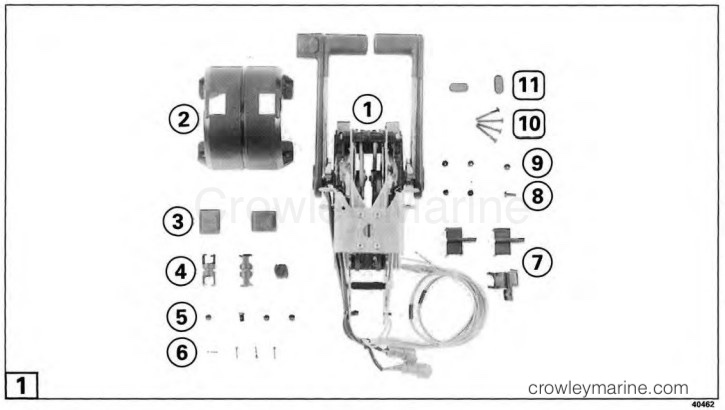 Evinrude/Johnson outboard motors; Separate connector between charge coil and ignition module, or disconnect all spark plug wires to keep motor from staring. OMC Cobra engines, see service manual. This remote control is designed to crank motor in NEUTRAL only. If control handle is "in-gear," starter will not operate. Use this test to make certain starter motor will NOT operate then control handle is in FORWARD or REVERSE and WILL operate when handle is in NEUTRAL. If pressing switch does not operate trim/tilt motor, check switch-to-motor connection. 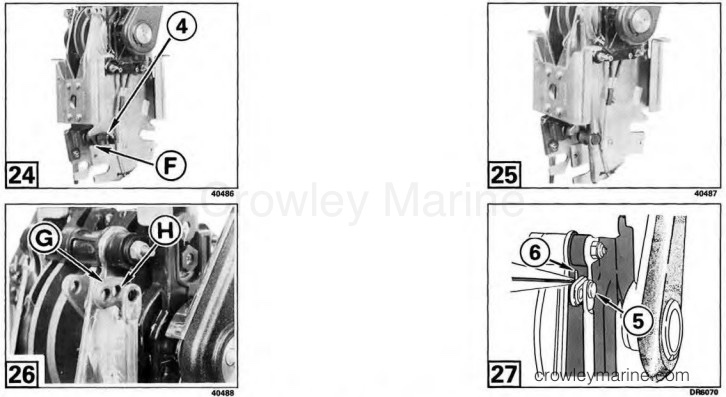 On Evinrude/Johnson outboard motors; Operate trim with lower motor cover switch (if on your motor). If trim does not work, have trim unit checked. If trim works with lower motor cover switch but not with remote control switch, have your dealer inspect remote control. Check throttle friction - Move each control handle to FORWARD throttle range. When properly adjusted, control handles should have low enough friction to allow easy movement in FORWARD throttle range, yet not allow vibration to change throttle setting. 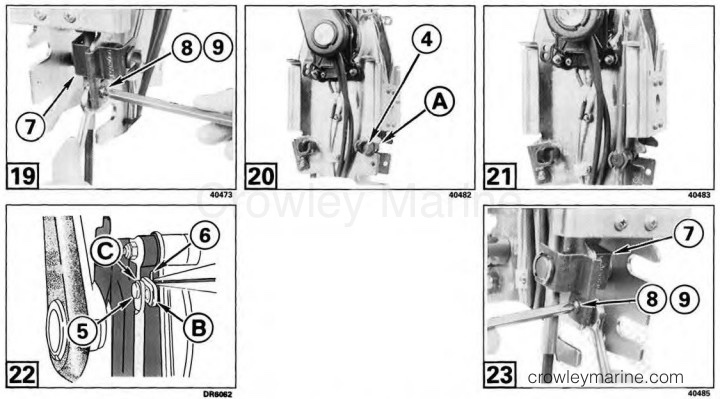 Adjust throttle friction - Remove adjustment screw cover (A) or (B) on control you want to adjust. Turn UPPER adjustment screw clockwise to increase friction.